The old Devil waited and waited for news from the imps of their having ruined the three brothers. But no news came. So he went himself to inquire about it. 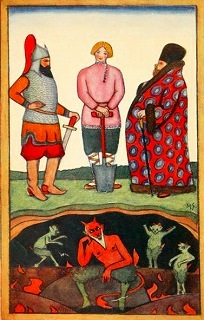 He searched and searched, but instead of finding the three imps he found only the three holes. So he went to look for the brothers, but they were no longer in their old places. He found them in three different kingdoms. All three were living and reigning. This annoyed the old Devil very much. 'First,' said he, 'we must levy more soldiers, for there are in your kingdom many people unemployed. We must recruit all the young men without exception. Then you will have five times as many soldiers as formerly. Simon the King listened to the new commander, ordered all young men without exception to be enrolled as soldiers, and had new factories built in which he manufactured large quantities of improved rifles and cannons. Then he made haste to declare war against a neighbouring king. As soon as he met the other army, King Simon ordered his soldiers to rain balls against it and shoot fire from the cannons, and at one blow he burned and crippled half the enemy's army. The neighbouring king was so thoroughly frightened that he gave way and surrendered his kingdom. King Simon was delighted. But the Indian King had heard about King Simon and had adopted all his inventions, and added more of his own. The Indian King enlisted not only all the young men, but all the single women also, and got together a greater army even than King Simon's. And he copied all King Simon's rifles and cannons, and invented a way of flying through the air to throw explosive bombs from above. King Simon set out to fight the Indian King, expecting to beat him as he had beaten the other king; but the scythe that had cut so well had lost its edge. The King of India did not let Simon's army come within gunshot, but sent his women through the air to hurl down explosive bombs on to Simon's army. The women began to rain down bombs on to the army like borax upon cockroaches. The army ran away, and Simon the King was left alone. So the Indian King took Simon's kingdom, and Simon the Soldier fled as best he might. Having finished with this brother, the old Devil went to King Taras. Changing himself into a merchant, he settled in Taras's kingdom, started a house of business, and began spending money. He paid high prices for everything, and everybody hurried to the new merchant's to get money. And so much money spread among the people that they began to pay all their taxes promptly, and paid up all their arrears, and King Taras rejoiced. And Taras the King began to form fresh plans, and began to build a new palace. He gave notice that people should bring him wood and stone, and come to work, and he fixed high prices for everything. King Taras thought people would come in crowds to work as before, but to his surprise all the wood and stone was taken to the merchant's, and all the workmen went there too. King Taras increased his price, but the merchant bid yet more. King Taras had much money, but the merchant had still more, and outbid the King at every point. King Taras planned a garden, and when autumn came he called for the people to come and plant the garden, but nobody came. All the people were engaged digging a pond for the merchant. King Taras wanted to buy some stallions. He sent to buy them, but the messengers returned saying, 'The merchant has all the good stallions; they are carrying water to fill his pond. All the King's affairs came to a standstill. Nobody would work for him, for every one was busy working for the merchant; and they only brought King Taras the merchant's money to pay their taxes. And the King collected so much money that he had nowhere to store it, and his life became wretched. He ceased to form plans, and would have been glad enough simply to live, but he was hardly able even to do that. He ran short of everything. One after another his cooks, coachmen, and servants left him to go to the merchant. Soon he lacked even food. When he sent to the market to buy anything, there was nothing to be got -- the merchant had bought up everything, and people only brought the King money to pay their taxes. Taras the King got angry and banished the merchant from the country. But the merchant settled just across the frontier, and went on as before. For the sake of the merchant's money, people took everything to him instead of to the King. and a rumour even got about that the merchant was boasting that he would buy up the King himself! King Taras got frightened, and did not know what to do.